I've been using the same type of planner for the past three years, just changing out the layout and add-ons as I go. I've been using the ME Planner by Plum Paper Designs on Etsy. This isn't a sponsored post and I don't get any compensation from it, I'm just sharing one of my all-time favorite organizing tools! I'm a paper planner kind of girl. But I'm also the "I need my phone to remind me of appointments" kind of girl. 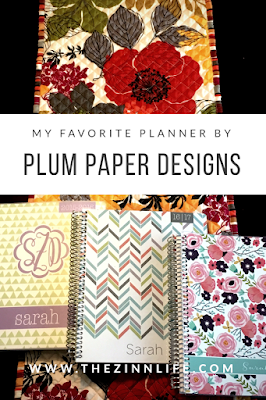 For the past three years, I've been using a planner by Plum Paper Designs on Etsy. I started using them because they had a direct sales section (back when I did Jamberry), but now I use them because they have a blog planning and fitness section. Next year, I'll probably add the baby section! I'm going to go through the planner, what I like, what's different and the two sections that I added on. Cause I'm nerdy like that and, if you're reading this, you're probably nerdy like that too! Each month of the planner opens with this page. You can set goals for the month, birthdays, events, things to remember, etc. And then there's a page for notes. The next page is the monthly calendar, which lays out the entire month. There is room on the side for more notes and lists. I changed my overall calendar design for the 2017 planner. In my last planner, I did a fitness planner (left) and chose to arrange the days by morning, afternoon and night. The fitness planner had a fitness goals and weekly checklist for each week plus space at the end of each day for recording your workout. You could also record your morning, afternoon and night calories. I found that I didn't really like the morning, afternoon and night because I was still needing to specify times to be most accurate (and on time!) and that I only utilized the workout and goals section each week. I use an app to track my calories and didn't feel the need to do double the work. So for 2017 (right), I changed to a basic planner format that breaks down the days by hours. This works much better for scheduling purposes. I still have room to write my goals, checklists, etc. The fitness stuff now gets tracked in its own section, which works better for me. In addition to the monthly section, there's a place for passwords, birthdays and special dates and notes at the end of the planner. There's also a half pocket that I use for random paper. The fitness section is now its own tab. The first page has a start and end date and start and end weight. You can set your affirmation statement, long-term and short-term goals and major milestones and rewards. While I'm not using it as much as I would before, it's a good way to set goals that aren't scale related. We aren't really friends right now. Each month has a two page spread. On the first page, you can track your weight weekly, measurements, monthly goals, etc. On the second page, you can track your exercises and water. This is honestly the page that I use the most. I like that it's all in one section because I update it a few times a week versus every day. The blog planning section is my favorite. I had it in the last planner and like the improvements made to it in this one. Before, the stats section was it's own page and you tracked it by week. Now, it's all on the same page as the goals, post schedule and income and expenses. The stats are tracked by the month, which I think is a bit cleaner. There's also a monthly task page. I don't use it as much but as I start growing the blog, I plan to use it more. A giveaways and reviews page tracks all of that on one page, where before it was a two page spread. Finally, there's an annual blog planner. This is great for planning out specialized and seasonal posts, sponsored posts, etc. For me, the blog planning section has really helped me plan out my posts, keep some consistency and track my stats. If you're looking for a good paper planner, check these guys out! They are on Etsy and have a bunch of different sections to add on including a baby, teaching, meal planning and family planning sections. Not to mention, the designs are super cute and you can customize them with your name, family name or monogram. Just a note - give yourself some time to order as they take about three to four weeks to ship. What's your favorite planner to use?